Conine is known as Mr. Marlin, as the only player to have appeared in the Marlins inaugural game in 1993 and both World Series victories, 1997 and 2003. Conine played for 6 major league teams in 17 years, half of those for the Marlins. He hit .290 for the Marlins (.285 overall) with 120 home runs (214 overall), 553 RBI (1071 overall) and a record 6 grand slams. On the Marlins’ inaugural opening day he went 4-4 ending the season having played all 162 games and finishing 3rd in the Rookie of the Year voting after a .292, 12 home run, 17 RBI season. The next two years he was named to the All-Star team, earning the game’s MVP honors in 1995. 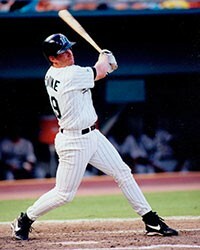 In 32 post-season games in 1997 and 2003, Conine hit .304 with one home run, 8 RBI and 15 runs scored. He is currently a special assistant to Marlins team president David Samson.